The in basket: Galen Danis, who I encountered during the recent Edible Gardens tour of Manette, said he was puzzled by something he saw early one morning in Bremerton. He was turning from westbound 11th Street onto Callow Avenue about 4 a.m. when the red light camera that watches for violations on northbound Callow flashed. There was no car on Callow at the intersection to trigger the flash, he said. He had a green light for his turn and the camera doesn’t react to cross traffic on 11th, but he sweated it for a few weeks wondering if a citation would arrive in the mail. But that never happened. He also wonders what constitutes a full stop, required at a red light to make a right turn on red legal. If a driver stops at the stop bar, then edges forward for a better view of cross-traffic and doesn’t stop again before turning, is that a violation, he asked. The out basket: Lt. Pete Fisher of Bremerton police said the system and its technicians run occasional checks, which will cause the strobes to flash. It’s a normal occurrence. The in basket: While touring food gardens in Manette Saturday during the Edible Garden Tour, I talked with Karen Danis at her Jacobsen Boulevard home, one of those on the tour. She asked me about what she considers the counter-intuitive traffic control on East 11th Street at Trenton Avenue, a few blocks from their home, where drivers may continue without stopping in the left turn onto Trenton. Drivers on Trenton northbound must stop and the very few wanting to continue south on Trenton must yield. Her husband, Galen, said he makes a hard right from Jacobsen’s angled approach, then left to approach the turn at a right angle and stay out of the way of cars turning from East 11th to Trenton. The out basket: I told them the intersection had been that way for as long as I can recall, and I doubt the city would change it, barring a rash of accidents there. It would change driver’s expectations after decades of it being as it is. As an example, there still are many drivers coming off the Manette Bridge and not yielding to traffic in the new roundabout there, which I think is attributable to the decades of them having the right of way when leaving the bridge. That changed just this year. Reader Jan Luckcuck wrote last week saying it’s still happening, twice to her in the previous two weeks while she was in the roundabout. I’m unable to guess what experience caused the city to allow lefts without stopping on East 11th at Trenton, and I imagine anyone in city government at the time who would know is long gone. Do any of you old-timers, perhaps residents of that area, recall what led to the strange arrangement? What happened to plans for Narrow Bridge lights? The in basket: Don Brandvold writes to say, “I was driving over the Tacoma Narrows Bridge the other night and noticed how dark the bridges are. The out basket: There still is hope, says Desa Gese Coniff, a Tacoma lawyer who speaks for the organization. But they have been unsuccessful so far in getting final state approval for what they want to do. They were very close to a start on the project, she said, when the state’s mounting financial problems caused it to take away money the group was expecting. Then a lead state engineer objected to the plans that had gotten earlier approval, and efforts to get approval drag on. Assignment of the objecting engineer to the Alaskan Way viaduct project may be a factor, she guessed. She also said the state so far doesn’t want the lights they are proposing to be used to their full capability, specifically changing colors and blinking. “We have continued to tweak our plan for his approval and have found another light that would cost less,” she said. “We haven’t heard anything lately.” They seek to light both the old and new bridges. They haven’t actually raised any money yet, she said, something they avoided to keep from having to return it. They’ll seek donations from private sources after the state signs off on the work. “We have put thousands of hours into this, but until we can get the past this DOT issue, we can’t proceed,” she said. Their Web site, narrowsbridgelights.org, isn’t being updated, she said, and my browser couldn’t find it. . The in basket: As I sometimes do, my interest today wanders over the mountains where Port Orchard’s Allan Limbocker seeks an explanation of something he encountered near Cle Elum on July 6. “We were driving from Cashmere to Port Orchard. About 2 p.m. we encountered a very bad stretch of roadway on Highway 970 just past the cutoff to Ellensburg. “The roadway became very hard to navigate,” he said. 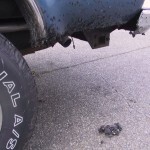 “It was like they had just dumped gunk on the road and then just left it. No workers were visible. Drivers were trying to drive on the shoulder to avoid having their vehicles coated/splashed with whatever was on the road. “Many drivers pulled over and were trying to scrape the gunk off of their vehicles with sticks or their hands. The substance was falling onto the road as the cars continued to drive. We finally stopped in Cle Elum and our truck was a mess. “I am wondering what was on the road, and who is responsible for the destruction that it caused on multiple vehicles, including motor homes, boats, and trucks. I did not know what to use to clean my truck and tried to kind of roll it off. Nothing seemed to work. That next morning a pile had fallen off of the truck and was just lying in the driveway. “This was extremely dangerous and damaging to the vehicles. The out basket: Allan saw a chip seal operation overtopping a crack sealing operation, a very common form of inexpensive paving used by many jurisdictions. Since the common practice is to let traffic travel over gravel spread atop a layer of oil, letting the tires help compact the gravel into a driving surface, you wouldn’t necessarily see work crews. There often are complaints about rocks flying during the compaction, but the Cle Elum experience was worse. 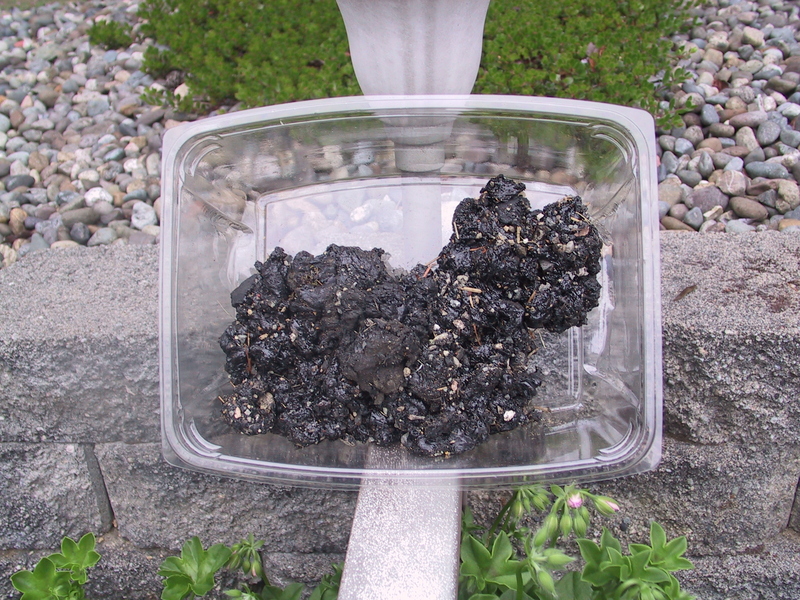 In this case, says Mike Westbay of WSDOT’s communications office there, either rising heat on a hot day or something else caused a rubberized material used to seal the worst cracks on the highway to seep up through the oil and gravel. signs were taken down and crews were preparing to leave for the week,” Mike said. 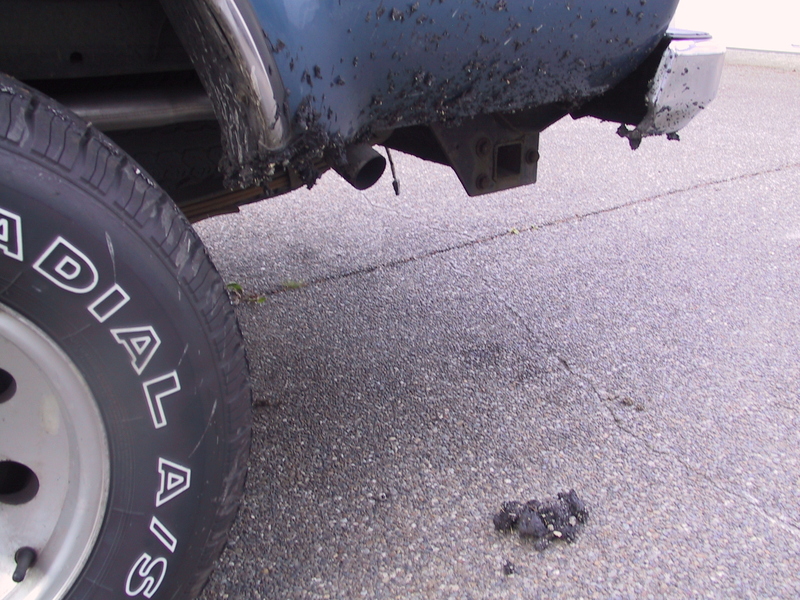 “At about 1 p.m., the rubberized sealant began sticking to vehicle tires. stick to the tires of passing traffic. 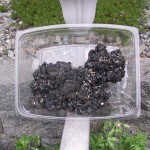 material to build up on vehicle tires. for instructions on submitting a claim, he said. The in basket: Herron Miller, the Sun’s night new editor, emailed July 2 to say, “Saw something on way into work this afternoon you might ask about. “I was coming off southbound Highway 3 to turn left onto Kitsap Way. A DOT truck was parked at corner of the exit ramp and Kitsap Way. A worker was putting several yard signs into the truck. One that I could see was a political yard sign. Not sure where he pulled them from, but they were ending up in the back of his truck. “Just wondering what are the rules on yard signs? They seem to litter the sides of roads everywhere … why would the ones he was taking be targeted? The out basket: Duke Stryker, supervisor of state highway maintenance crews here, says his employees rarely make a special trip to deal with such signs, but will remove them if they are on other business, such as litter removal. The signs will get more directed attention if they obstruct driver vision. It’s not legal to put them on state highway right of way, and that includes political signs, he said. He thinks candidates get a flyer from election offices telling them that. His office hangs on to removed signs for a while, in case the candidate or business wants to reclaim them. And he denied a common accusation, that his crews target one party or another or one side of an issue.